Choose our King Flinders Room and enjoy fantastic views of the Melbourne streetscape, as well as natural light throughout the unique 31 square metre space. Designed to ensure that you get the rest you need, black out electric blinds give you full or partial coverage so you can enjoy the Melbourne lights. Rest easy in your pillow top performance bed with your choice of soft or firm pillows for the ultimate night sleep. Get ready for the day or night with upgraded bathroom amenities including dual sinks and rain shower, plus plenty of natural light. Admire the Melbourne city street from your leather lounge chair with our floor to ceiling windows. The King Flinders room has the newest technology, including a MediaHub which has HDMI and USB connectivity and complimentary wifi. Sit back with a latte from our 24 hour room service or enjoy 30+ channels from Foxtel and free-to-air on the 55″ full HD TV. 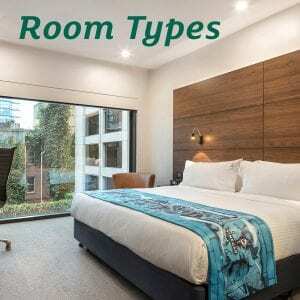 Holiday Inn Melbourne on Flinders is a great choice for friends or couples who are in Melbourne for work or leisure and after something a little extra.